LIMIT 20, 10 on the same query only takes several milliseconds. It means that though we only need 10 records we still need to count off the first 150,000. The table has an index which keeps the records ordered. This allows us not to use a filesort. However, the query is still far from being efficient: 15 seconds for 150,000 records (which are already ordered) is way too much. As we already said before, there is an index created on the table. Logically, an index is a part of a table which is not even visible from the SQL side: all queries are issued against the table, not the index, and the optimizer decides whether to use the index or not. However, physically, an index is a separate object in the database. Index key, i. e. the columns which the index created on. Table pointer, that is some value that uniquely identifies a row the record reflects. In InnoDB, it is the value of the PRIMARY KEY; in MyISAM, it is an offset in the .MYD file. The index records are stored in a B-Tree structure which make the ref and range searching on them super fast. However, the index itself does not contain all table's data: only the subset we described above. 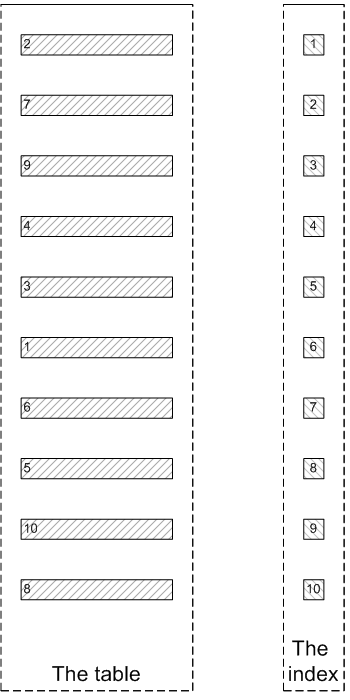 To find the actual table values while preserving order, one needs to join the index and the table. That is for each index record the engine should find the corresponding table record (using the row pointer) and return all non-indexed values from the table itself. The process of fetching the table records corresponding to the index records is called row lookup. 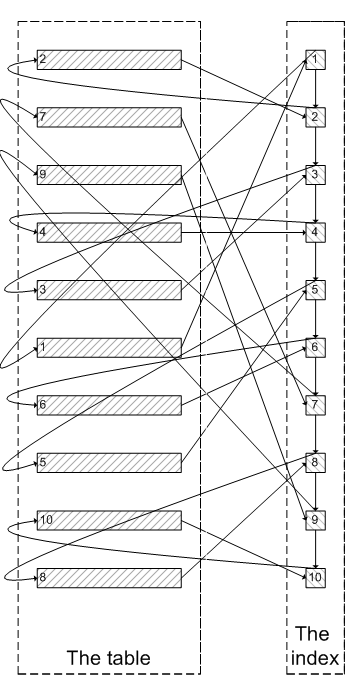 It is pictured by the curvy arrows connecting the index and the table. Since the index records and the table records are located far away from each other in the memory and on the disk, the row lookup leads to much more page misses, cache misses and disk seeks that a sequential access and is therefore quite costly. It takes much time to traverse all the connectors on the picture above. If we do a plain query which returns all the records we of course need to fetch all the records and each row lookup is necessary. But do we really need it when we use a LIMIT clause with the offset greater than 0? We see that this is a much more efficient algorithm that will save us lots of row lookups. 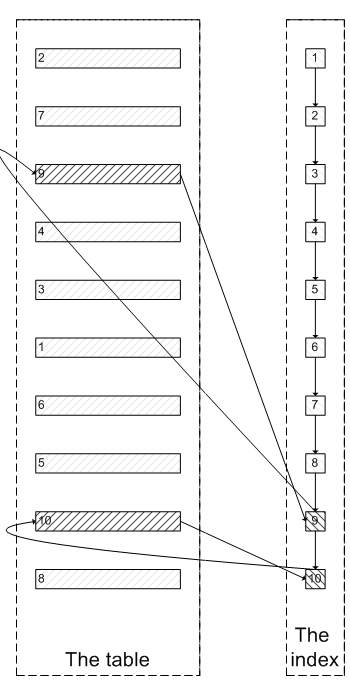 This is called late row lookup: the engine should look a row up only if there is no way to avoid it. If there is a chance that a row will be filtered out by using the indexed fields only, it should be done before the rows are looked up in the actual MySQL table. There is no point in fetching the records out of the table just to discard them. However, MySQL always does early row lookup: it searches for a row prior to checking values in the index, even the optimizer decided to use the index. This MyISAM table contains 200,000 records and has a PRIMARY KEY index on id. Each record is filled with 200 bytes of stuffing data. This query works for almost 6 seconds which is way too long. It, however, uses a filesort which the optimizer considered more efficient than using the index. This would make sense if not for the stuffing field which is too long to be sorted efficiently. In this very case traversing the index would be faster. Now it is only 1.23 seconds but still too long due to the early row lookups. We, however, can trick MySQL to use the late row lookups. We will only select the id in the subquery with an ORDER BY and LIMIT and then join the original table back on id. This is only 75 ms, or 16 times as fast as the previous query. Note that we put an additional ORDER BY to the end of the query, since the order is not guaranteed to be preserved after the join. This resulted in an extra filesort in the plan. However, the actual plan used outputs the values already sorted and this filesort, therefore, will require only a single pass over 10 values which is instant. @liuyuxun: what if ids are not consecutive? Wow that’s horrible. Do you know if Postgres also suffers from that? @Martin: until 9.2, PostgreSQL was not capable of index-only scans at all, since index records do not store information of transaction which created them and hence their visibility could not be determined without examining the table record. I don’t understand how come this “late row lookup” is not part of MySQL query optimizer? It’s such obvious and simple implementation, after all. Or I am missing something here! I was referred to this site after posting a question on SO. I think this solution only abstract away the slowness due to optimizer not using the key, but does not abstract away the problem of scanning the index in the wrong direction due to the large offset. One way to make it even faster is to calculate the offset in the opposite direction when offset is larger than half the total rows and then sorting it in the opposite order before reversing the order back again from the result. This will make the query blazing fast at both head and tail end of the query. @QuestionOverflow: this would make sense for MyISAM if it were not dead. Sorry, I wrote too early. I miss the point that you have no WHERE clause within your subquery, which explains why you are able to reduce the query time to 75ms despite having a large offset. @Quassnoi, what do you recommend as a replacement for MyISAM for a read-heavy server? @Quassnoi, I tried InnoDB before and felt that it is still much slower than MyISAM. That is why I am still sticking to it although the trend now is more towards InnoDB. If I use the following sql, will it be more sufficient? Does this work on queries with multiple joins and ORDER BY string as well? @Armin: does what exactly work? In reality, wouldn’t you normally want some kind of WHERE condition somewhere? Wouldn’t this undermine the strategy outlined above? @ZC: there is a WHERE condition in the original query, that’s exactly what causes the problem. If not for the WHERE condition, MySQL would probably read right from the table itself and not doing the PK lookups at all. LOL. The author needs to do some reading on how InnoDB stores its data. Hint: InnoDB tables are what’s called clustered tables ie there is no separate PK index. Given that the author is clearly referring secondary indexes, he is strictly correct. While it’s petty and mean-spirited to ridicule a helpful article and author like this 5 years after its publication; it’s laughable you attempt to do so because you cant properly infer the intent and context of the author. Further, your attempt at being hyper-correct has made you incorrect. The pk IS a separate structure and concept in innodb tables, the special behavior you are incorrectly attempting to rub in the authors face is actually simply that the primary key for a given record acts as a pointer to the page that contains the record data itself. In early versions of 5, the PK and data were literally on the same page (i believe this caused issues with key length for both primary and private keys, but dont quote me on this). Things may have change in more recent versions of My, but honestly, not worth the effort to find a more detailed elaboration. tl;dr. if you dont have something nice to say, dont say anything at all; If you dont have anything correct to contribute, then go stand in the corner and be quiet.